Every time I begin writing about my advertisement record collection, I have to suppress an urge to excuse myself for loving this stuff. From a musical standpoint it is pretty crappy material. But these records form an unique chapter in the history of Holland, and not a well known chapter. The main stream media have completely overlooked many aspects of history, and the advertisement records are one of them. I love to see all these, often very clumsy, attempts to raise some attention for a long forgotten product. Next week I have a meeting with the people with whom I will write a book about Dutch advertisement records, and to warm myself up I have begin listening to these records again. 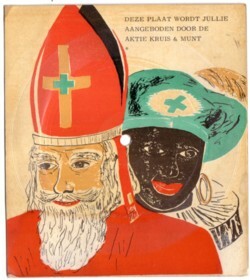 There about six or seven advertisement records that have something to do with Sinterklaas. I will not going to let you hear all these records, but I do want to show them to you. There was an article in the newspaper last week about this years’ Sinterklaas exploitation wave. 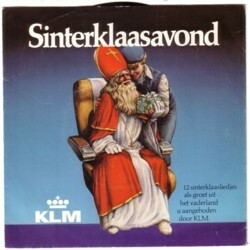 In the past few years every November tonloads of Sinterklaas CD’s are released, trying to cash in on the success of the myth. Most of these CD’s are labours-of-greed, lacking any inspiration or love. One of the artists responsible for such productions admitted without any shame that these CD’s were made in a lost afternoon. Yuck fou! I wish and hope that one day, and why not next year, somebody will record a CD with some real inspired stories and songs, that do justice to the most popular myth that lives in Holland. Strange as it may seem, such a CD does not exist. 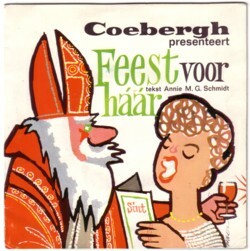 One of the Sinterklaas advertisement records that stands out, is a 45 made by Coebergh. The record contains two stories, written by Annie M.G.Schmidt and Henri Knap and read/played by Mary Dresselhuis and Co van Dijk. On one side is story for her about Sint Nicolaas, and on the other side is a story for him, about Christmas. 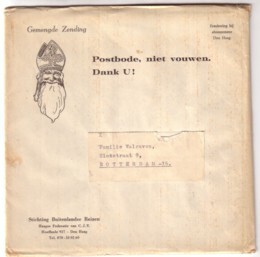 Maybe I will share the Christmas story with you later this month, although I doubt that, because I am not a fan of Christmas, but here is the Sinterklaas-side of the record. Houd ons vooral op de hoogte van dat reklamesingleboek. Misschien een beetje vroeg, maar ik wil er nu alvast één bestellen! Je hangt, Bas. En dat is voor 25 euro. Maar ik moet het boek (met twee ceedees) eerst nog zien.